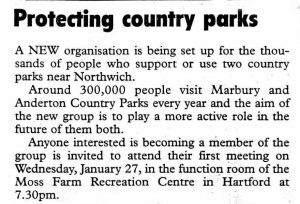 In January 1999, the following press release appeared in The Sentinel encouraging people to get involved helping to play a more active role in the future of Marbury and Anderton Country Parks. 20 years on from that first meeting on Wednesday, January 27th, 1999, the Group continues to grow and now has a membership over 220. Join us for an illustrated talk at 7.45pm on Monday 18th March 2019 at Comberbach Memorial Hall to celebrate FoAM’s achievements during its first 20 years.